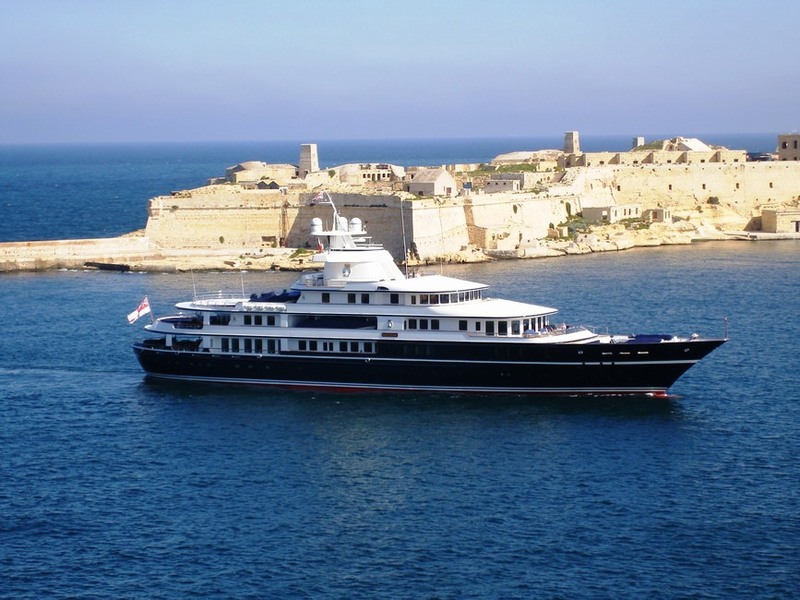 Designed by Kusch Yachts of Germany and built at Peenewerft LEANDER G at 74,98m (246') is still one of the gracious large superyachts of the world with her blue hull, canoe stern and lovely proportions. 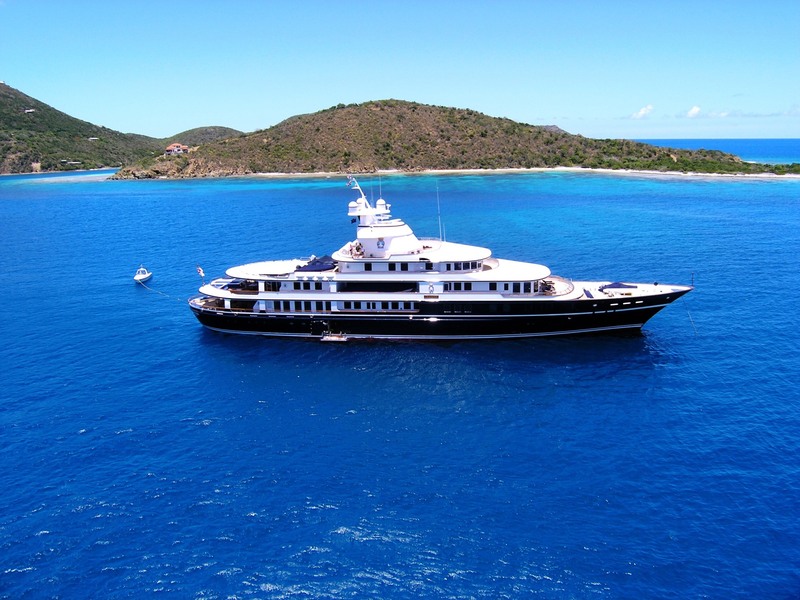 With a traditional luxury yacht interior she is able to very comfortably accommodate up to 12 charter guests. 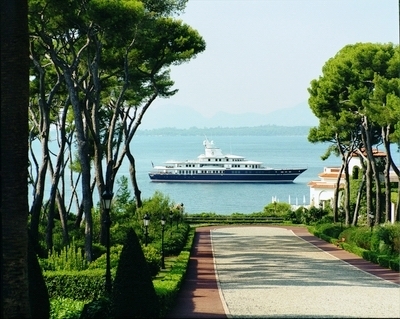 The crew is courteous and friendly, immaculately uniformed, skilled in their jobs, and working around the clock to please the guests. 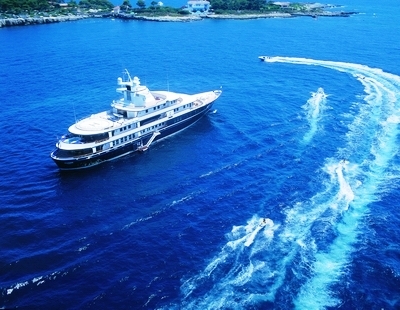 Having 24 crew means that everything happens with stunning efficiency – when the yacht arrives at a deserted white sand beach, within a minute the dive room door is open and the swim platform deployed; the tenders, wave runners and sailing dinghies are lowered into the water; and the anchor is down. The crew will have prepared all the necessary items to set up a beach ‘haven’ and the chefs could have prepared a picnic. With so many people working as a highly motivated team… the fun can start sooner, and the guests can be as demanding as they like. With an expanse of soft rugs, comfortable armchairs and sofas and beautifully crafted furnishings, the main saloon provides unparalleled relaxation. Windows from the stern, port and starboard play on the soft yellow and cream décor to create a warm haven of tranquillity. This is balanced by the dark wooden furnishings and dramatic large oil paintings depicting tumultuous oceanic scenes. A beautiful grand piano and compelling fabric wall hanging complete the sense of secluded harmony. The room also houses a collection of several hundred DVDs and contains a stairway leading to the guest cabins below. 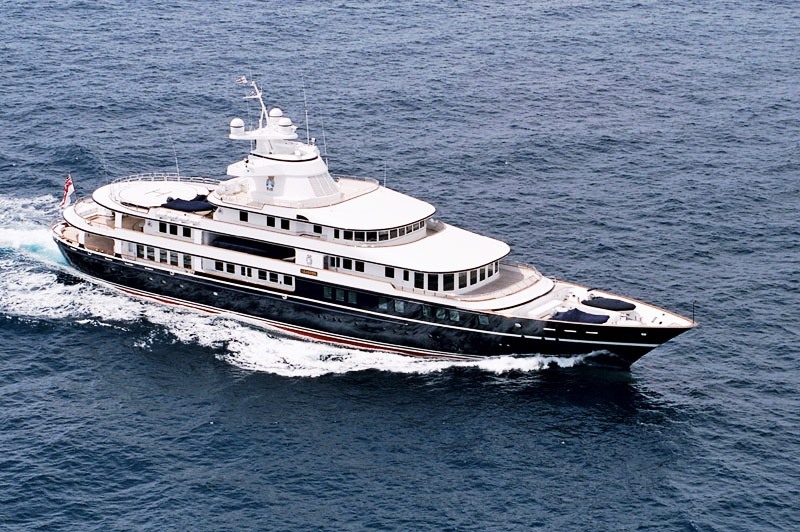 Large glass sliding doors open onto the aft deck where panoramic views from the stern of Leander G can be enjoyed. With large windows to port and starboard, the dining room is exceptionally illuminated, which complements its styling and decor. Marble effect pillars surround the room and complement an expansive timelessly tranquil wall painting that runs along the length of the forward wall. Depicted Greek God-like figures drinking iced champagne with mermaids and men in suits under a canopy of trees characterise the compelling and unique nature of this painting and indeed, the room. The table itself continues the marble theme and is matched by light cream and peach cushioned chairs which easily accommodate up to 20 diners. The ceiling is designed so that its layered appearance gives the impression of looking through skylights onto a dream-like faintly clouded blue sky, to complete the environment of a most pleasurable and tranquil dining location. The awe inspiring panoramic/180 degree views of the Observation saloon give this room a truly exclusive feel. The light yellow and blue décor of the room create a fitting maritime feel and the abundance of natural light highlights an array of dramatic naval oil paintings. This theme is continued with an intricately crafted wooden model of the ‘Amerigo Vespucci,’ made in 1931, and compounded by the presence of two large ‘10th Royal Hussars’ drums, each supporting a bronze cavalier lampshade stand. From relaxing in front of the television, entertaining guests or working at the desk, the individuality of the room with its tasteful decoration makes it a pleasure to be in. With large glass double doors leading from the bar, the Spa Pool deck offers the finest in comfort on the exterior of Leander G. A large dining table is complimented by two smaller round tables for more intimate feel. 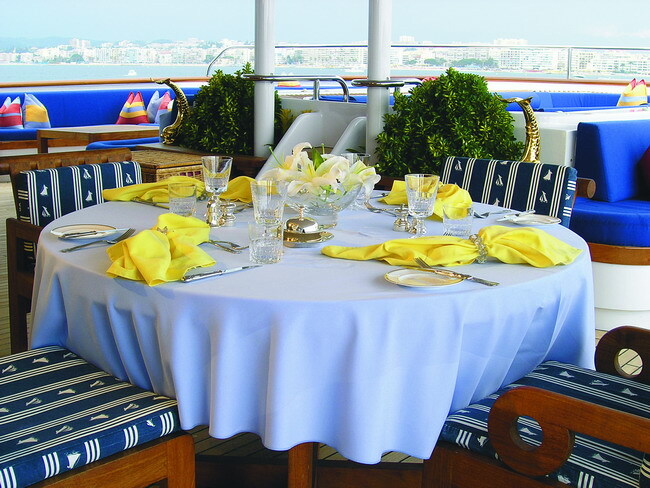 The pool deck is an exceptional dining location. 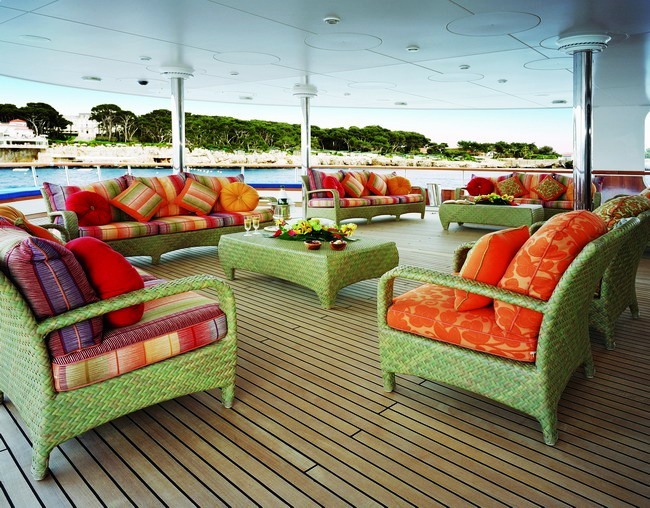 The pool deck offers180o views from the stern of the boat, the shaded tables or any one of the sun beds and loungers. The exceptionally well maintained teak deck and varnished Teak handrails project a truly exclusive sense which is retained by the flow pool. This can be employed both for exercise as well as enjoyment and relaxation. 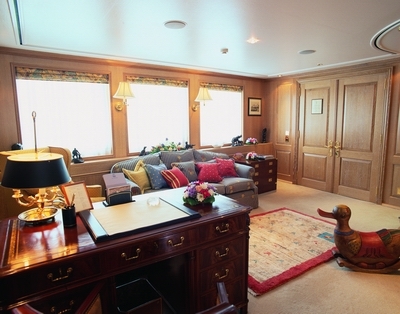 The Master Stateroom like the rest of Leander G, mixes impressive style with the utmost comfort. In the study, a faux bookcase of hard backed leather classics slides back to reveal a television, DVD and CD music system. The sturdy desk, model ships and maritime paintings combine to reinforce the peaceful décor of the room. Passing into the master bedroom through an optional/closeable sliding door, lies the king-size bed where, mounted on the opposite wall, is a wide screen plasma television with hidden DVD surround sound facilities. 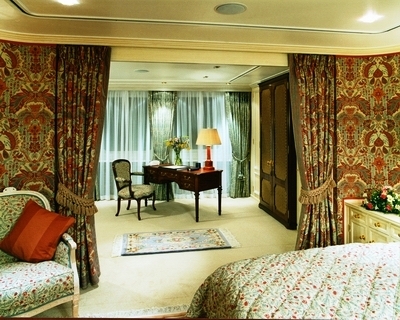 An entrance to the adjoining stateroom is available to the left of the bed and five large windows offer views out to port and starboard. Flanking the television are entrances to the dressing room and bathroom respectively. The luxurious bathroom is of the highest quality and features both a large bath and walk in shower. 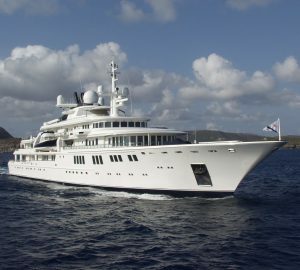 The concentration on space that characterises the suite is accentuated by the large mirrors and bathroom windows over the starboard side. Throughout the suite, the soft yellow focal colour combines with the light limed oak paneling to maximize the sense of space and light, as well as creating an atmosphere of relaxed serenity. Temperature and volume controls, steward call buttons and Audio Visual equipment all serve to create a perfect living environment. The soft coloured fabric walls, large rugs and focal windows create a true sense of relaxation and seclusion. A King-size bed dominates the bedroom area which adjoins a living/study area. A recurring sense of comfort and style is evident in the furnishing and the attention to detail, with the television, DVD/ CD surround sound system being hidden behind a sliding cabinet. The ample bathroom contains both a bath and walk-in shower as well as an extensive sink area. Light is maximised by the large mirrors which surround the bathroom. The study/living area can be separated from the bedroom with a heavy drawn curtain, though the four large port side windows provide impressive views and an abundance of natural light. The Gym is fitted with various equipment including a Concept 2 Rower and recumbent cycling machine for aerobic exercise, a weights bench and extensive range of weights for a full body anaerobic work out. A stretching bar running alongside the aft mirror facilitates a thorough warm up and a range of yoga and exercise DVDs offer guidance. These, or any other films can be easily viewed on the fitted television/DVD whilst exercising. The sauna with adjacent shower allows a refreshing work-down or a swim in the sea can be enjoyed through the adjoining dive room. Snorkeling equipment for 12, four full scuba sets and a wide selection of fishing equipment ensure that maximum enjoyment can be derived from the surrounding coast.